Suede Lab appliqued to plaid, suede trim. 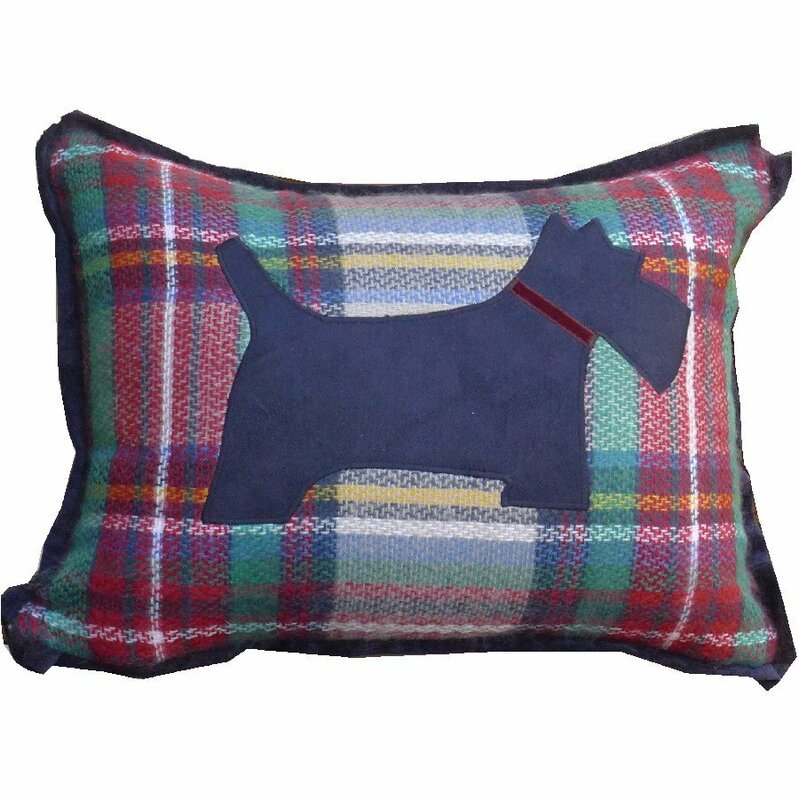 Suede Scottie appliqued to plaid, suede trim. 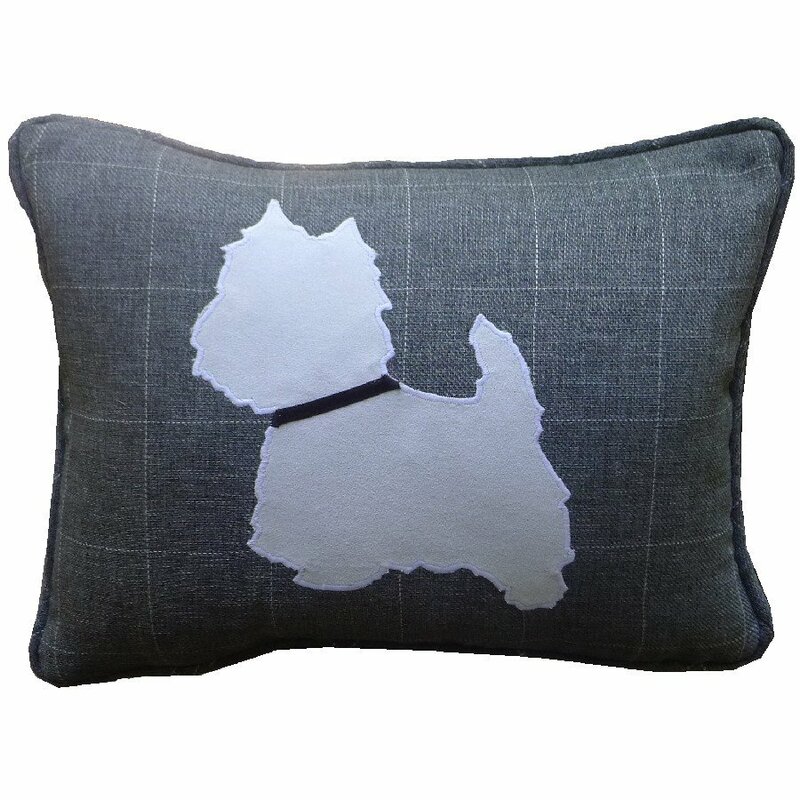 Suede Westie appliqued to plaid, suede trim. 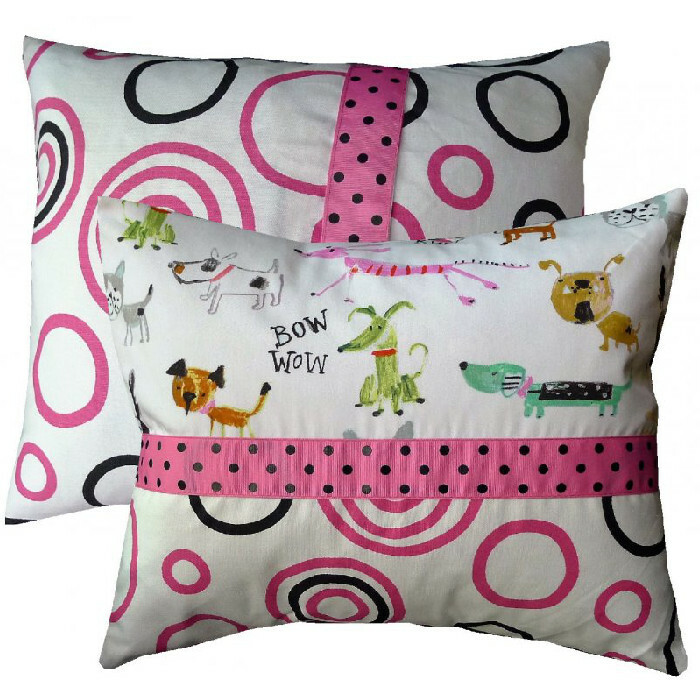 14×18 dogs, circles and dots in brightly colored pinks. 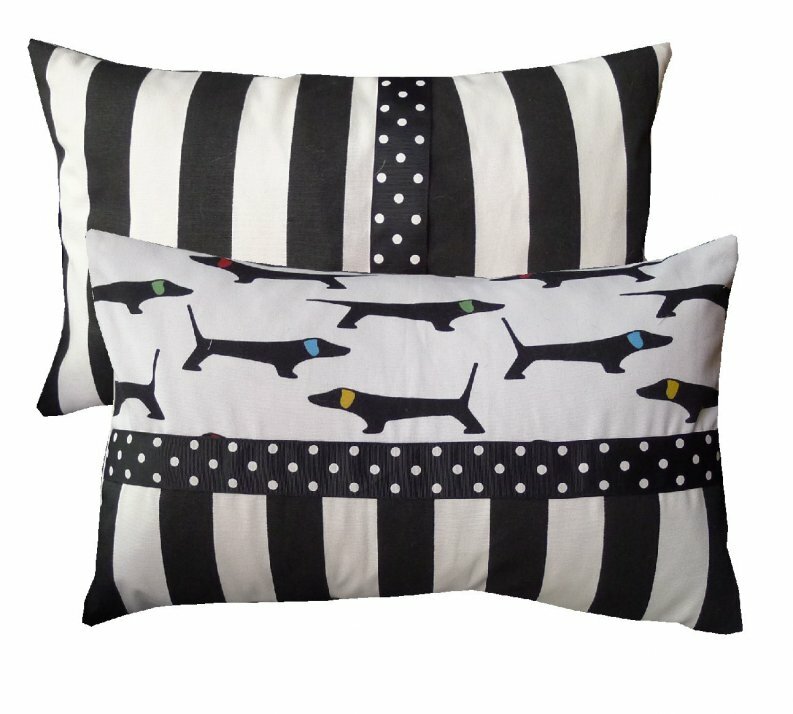 12×20 dogs, stripes, and polka dots. 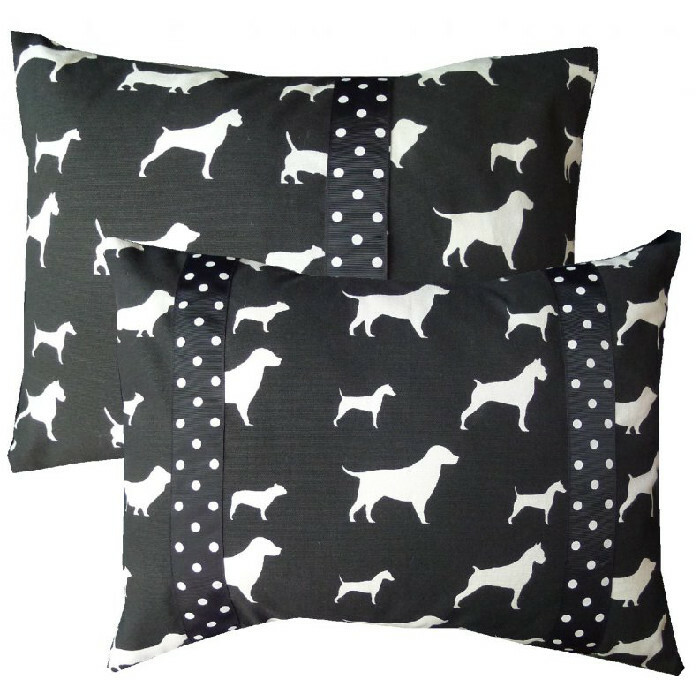 14×18 Best Friends print in black with white dogs and accents of black/white polka dots. 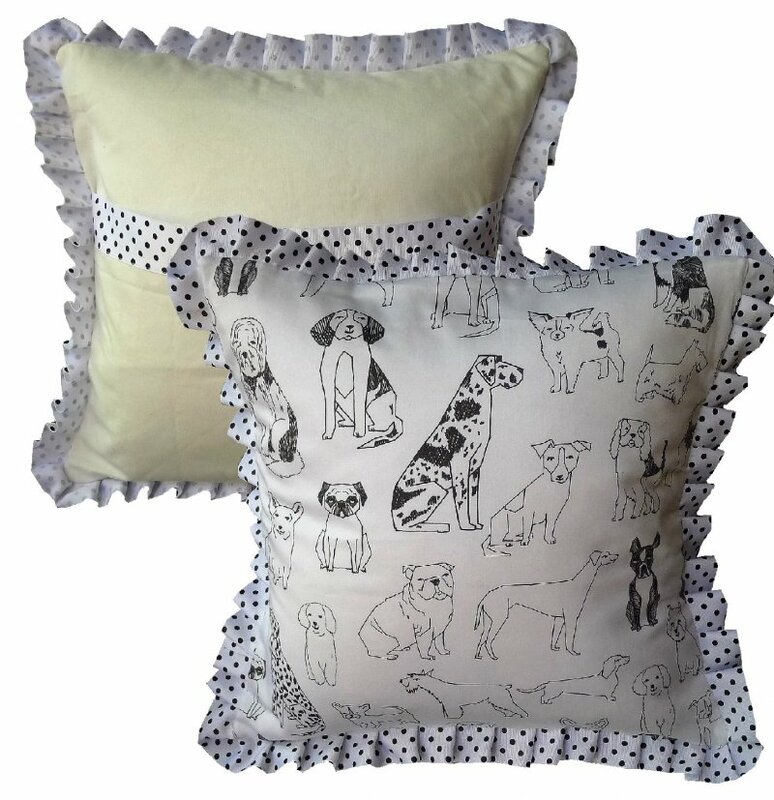 16×16 assorted dogs on white background with polka dot ruffle. 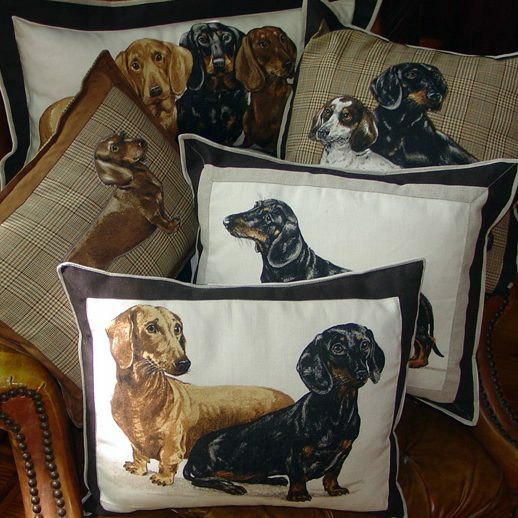 5 Dachshund dog pillows, 5 styles. 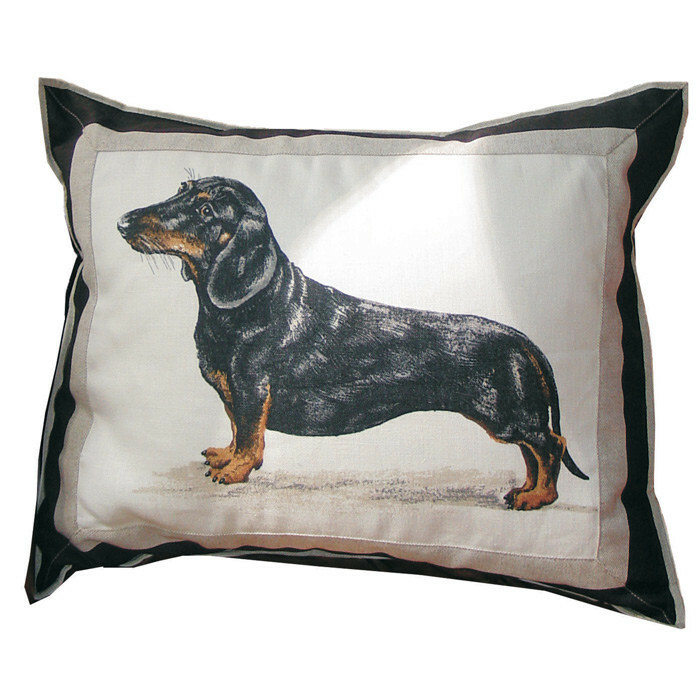 15×18 Dachshund pillow with 1 black dog in linen with chocolate border. 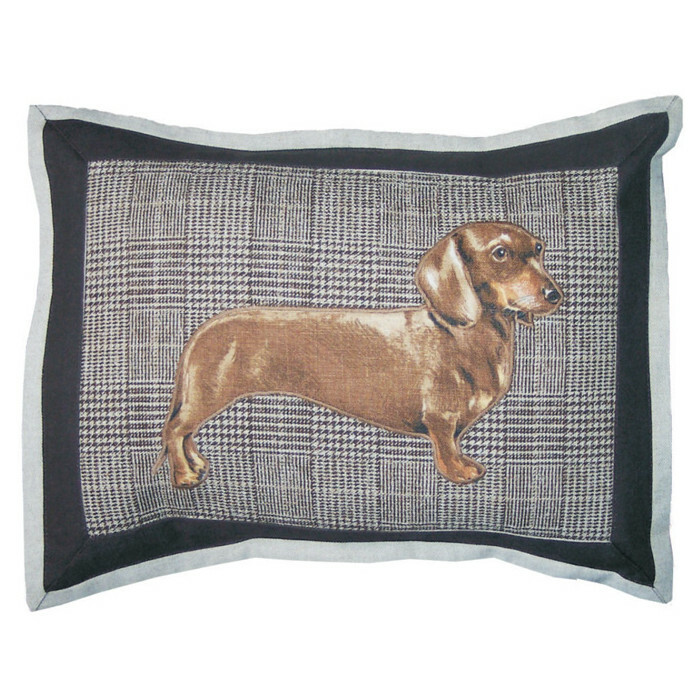 12×16 Dachshund pillow with 1 tan dog appliqued to tattersall with suede border. 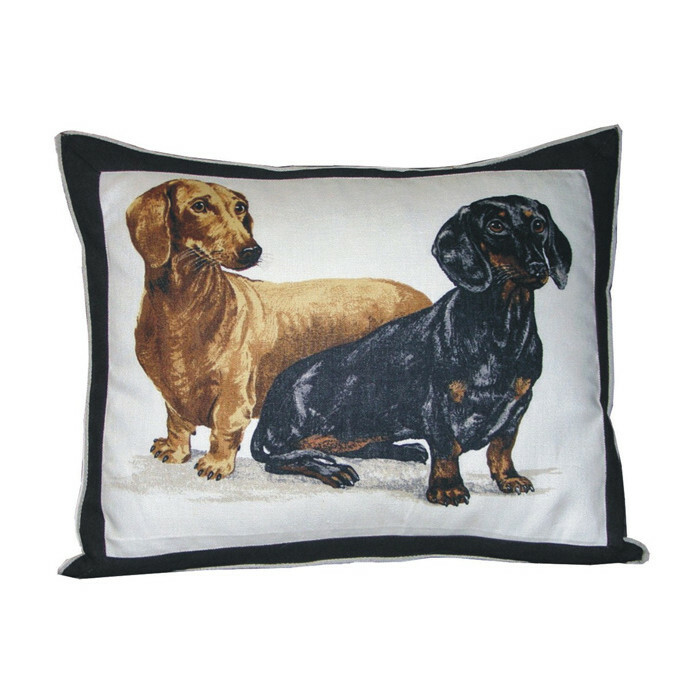 15×18 Dachshund pillow with 2 dogs in linen with chocolate border. 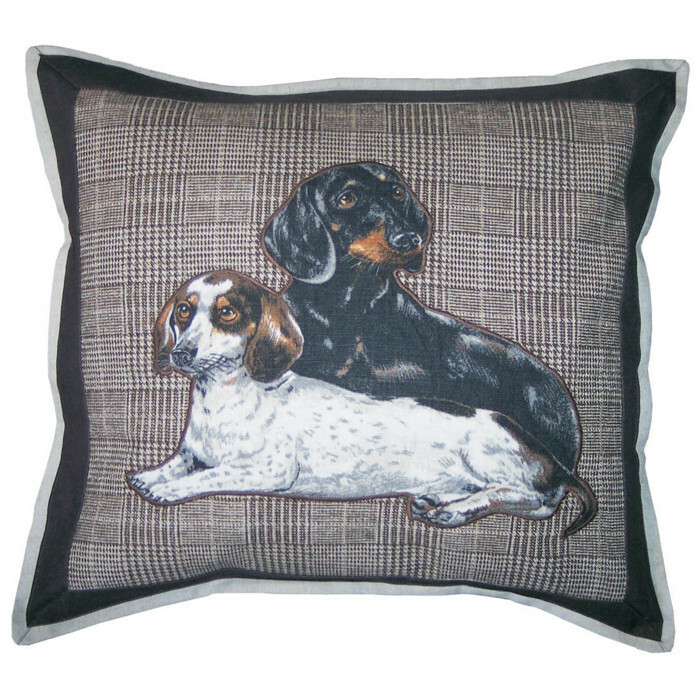 15×18 Dachshund pillow with 2 dogs appliqued to tattersall with chocolate border. 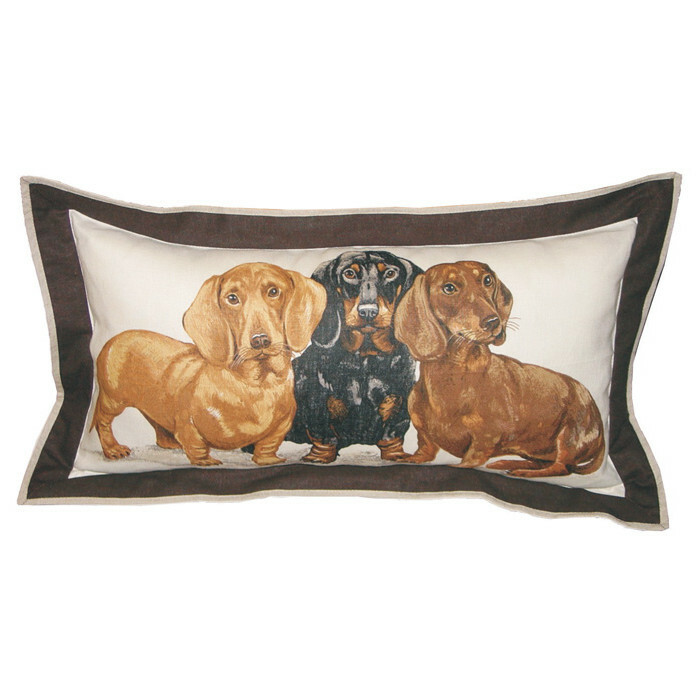 12×22 Dachshund pillow with 3 dogs in linen with chocolate flange border. 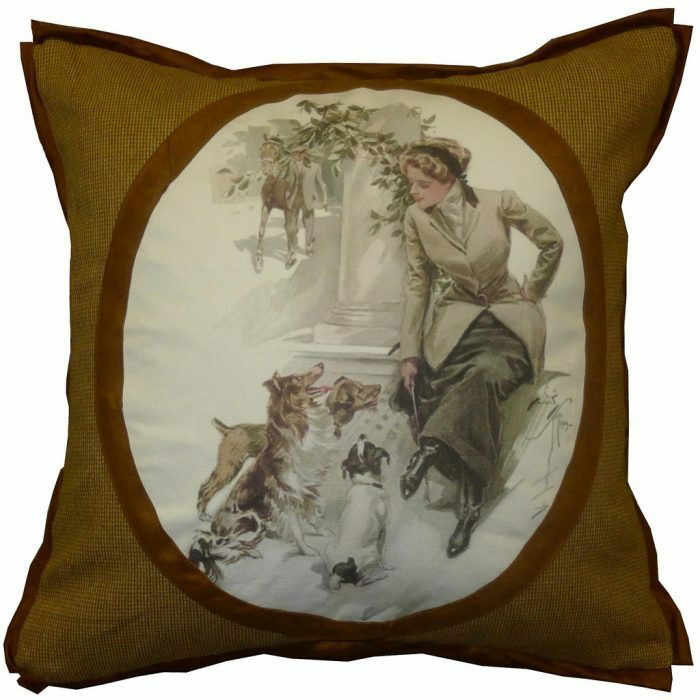 22×22 pillow of an Edwardian lady with hunt dogs placed in an oval on small check with brown suede narrow flange and back. 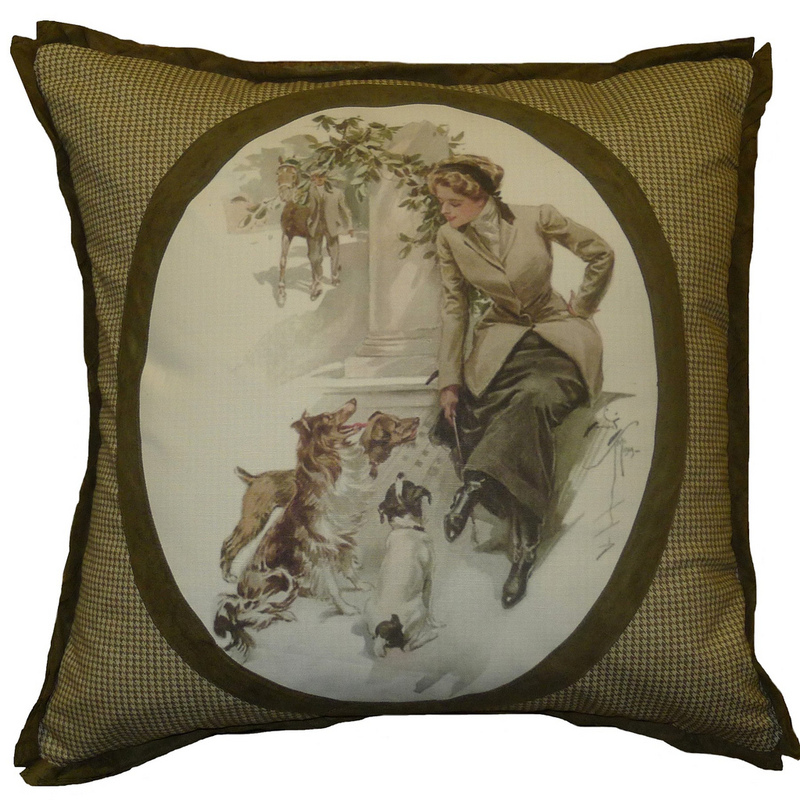 22×22 pillow of an Edwardian lady with hunt dogs placed in an oval on small check with suede narrow flange and back. English Breed framed in silk check. 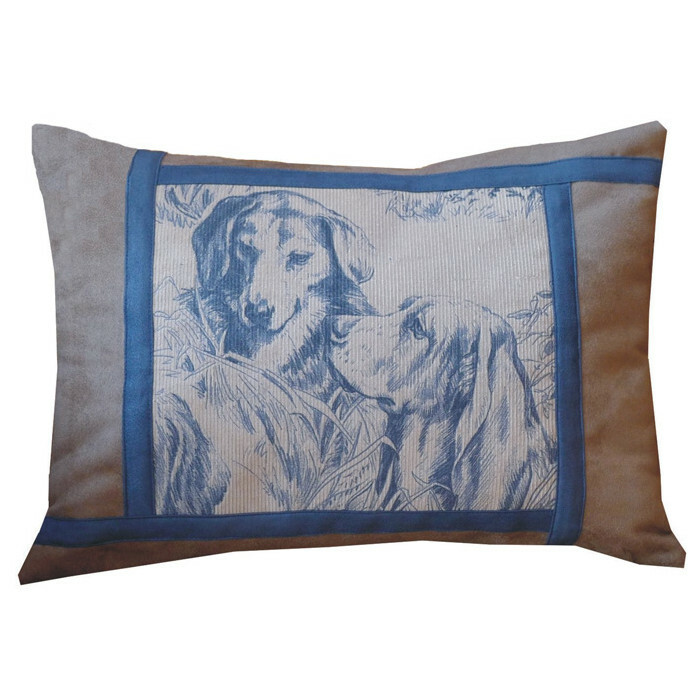 Lee Jofa printed linen portraying 7 dog breeds. 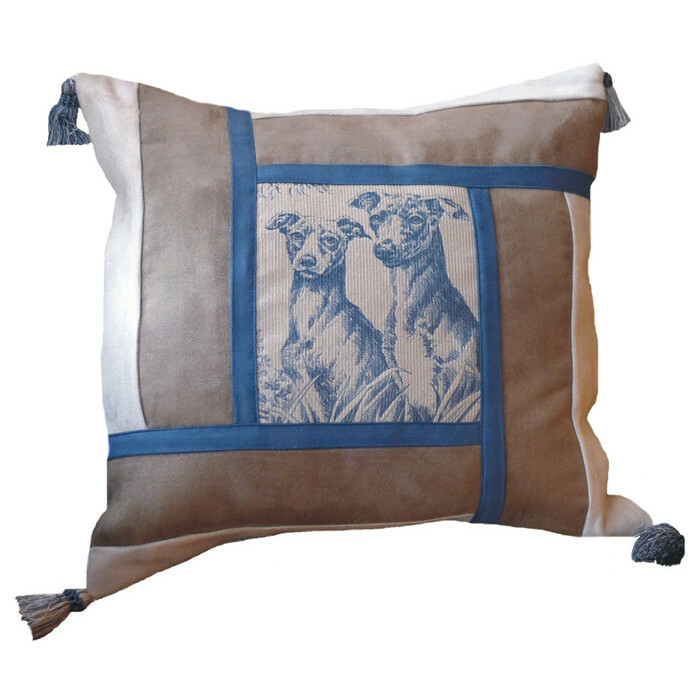 Select the breed you want in the center framed in silk check and ruched trim. Choose from Norfolk/Norwich Terrier, Welsh Corgi, West Highland Terrier, Yorkie, King Charles Spaniel, Jack Russell, Pug. 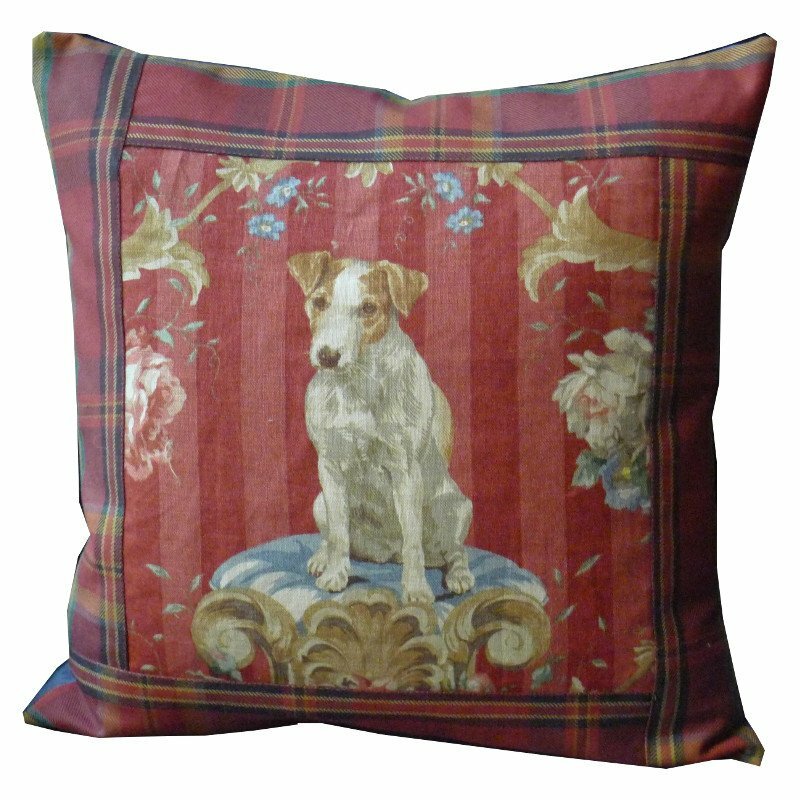 English Breed framed in plaid. 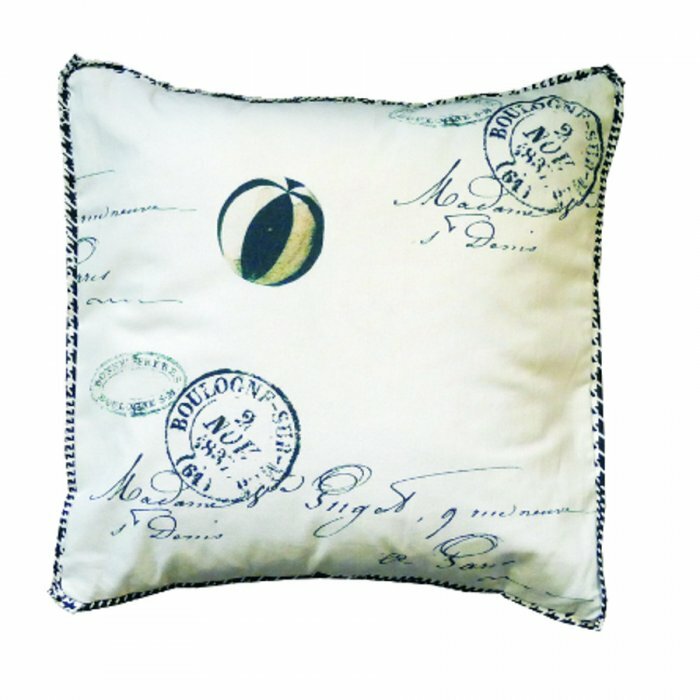 A Lee Jofa printed linen portrays 7 dog breeds. 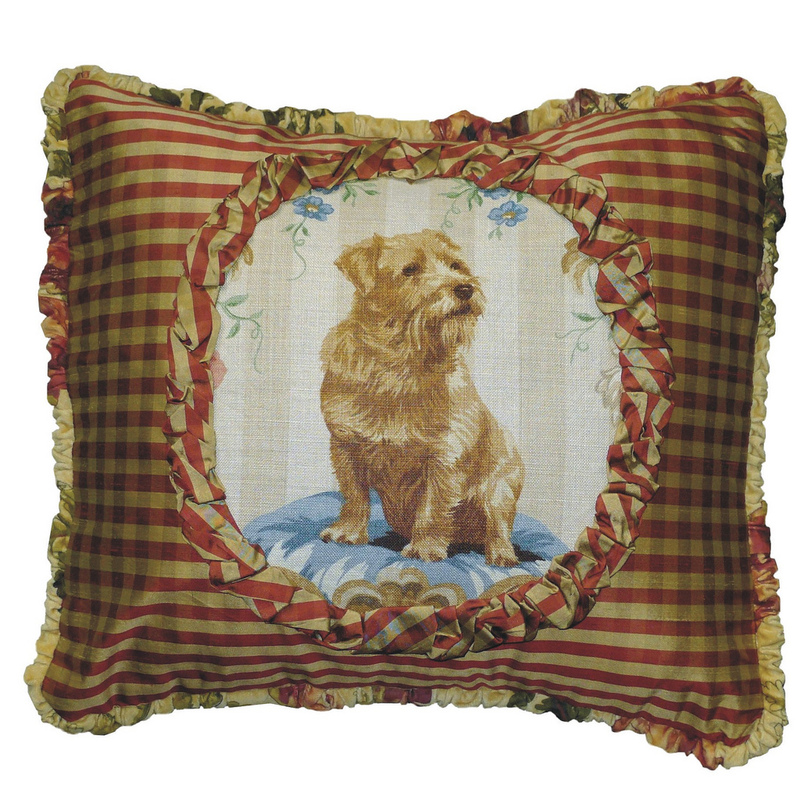 Select the breed you want in the center framed in plaid with suede ruffle. 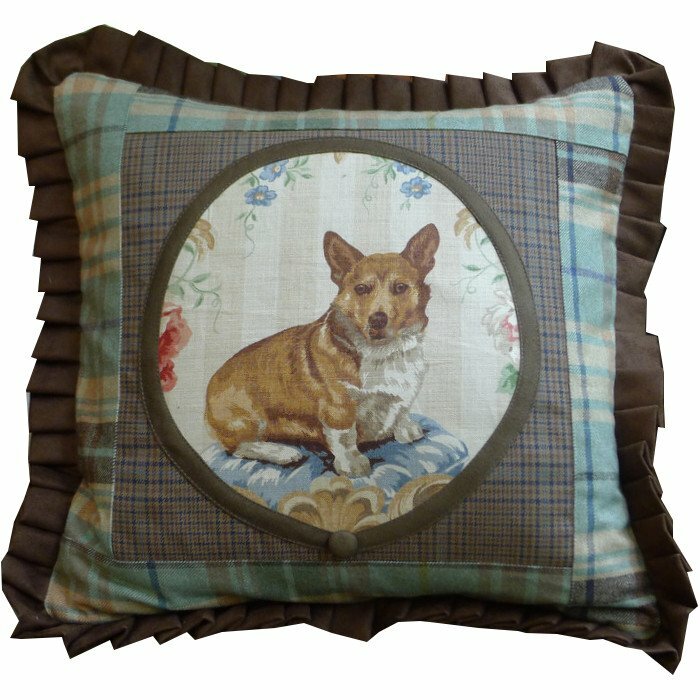 Choose from Norfolk/Norwich Terrier, Welsh Corgi, West Highland Terrier, Yorkie, King Charles Spaniel, Jack Russell, Pug. Shown with blue plaid, also available with red plaid. 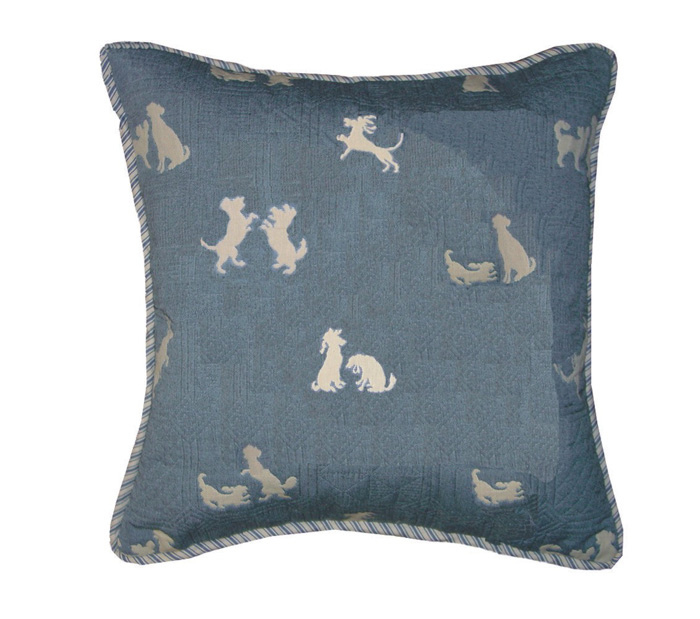 Lee Jofa printed linen portraying 7 dog breeds. 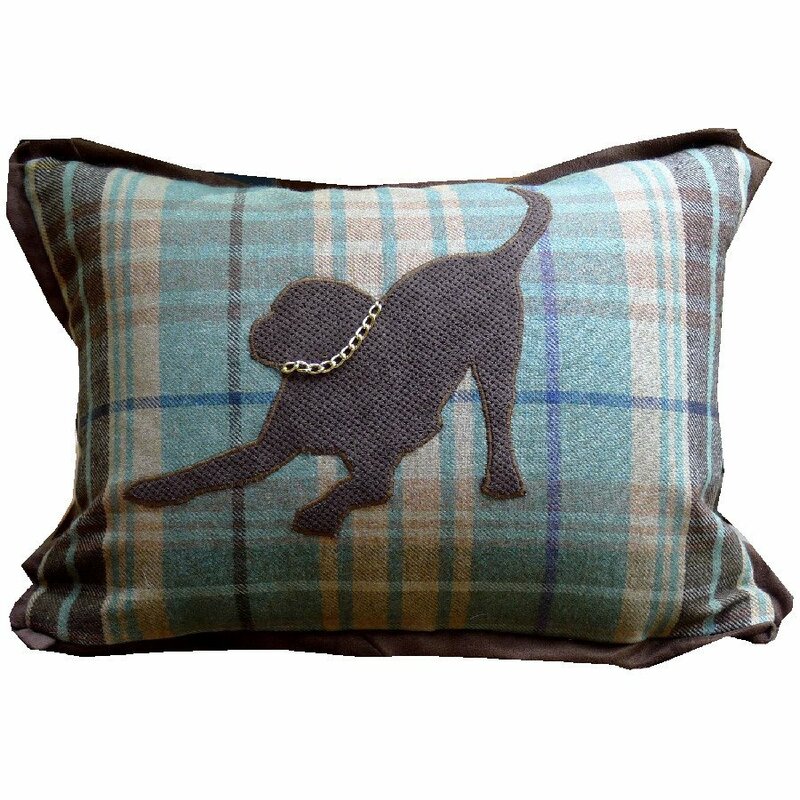 Select the breed you want in the center framed in plaid with suede ruffle. Choose from Norfolk/Norwich Terrier, Welsh Corgi, West Highland Terrier, Yorkie, King Charles Spaniel, Jack Russell, Pug. 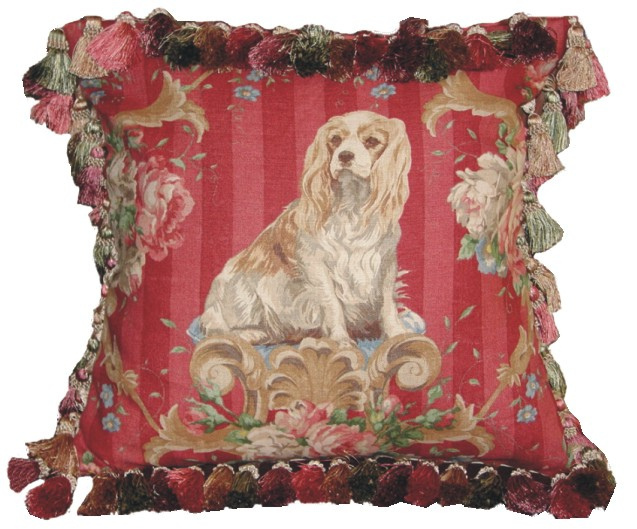 English Breed with tassel trim. 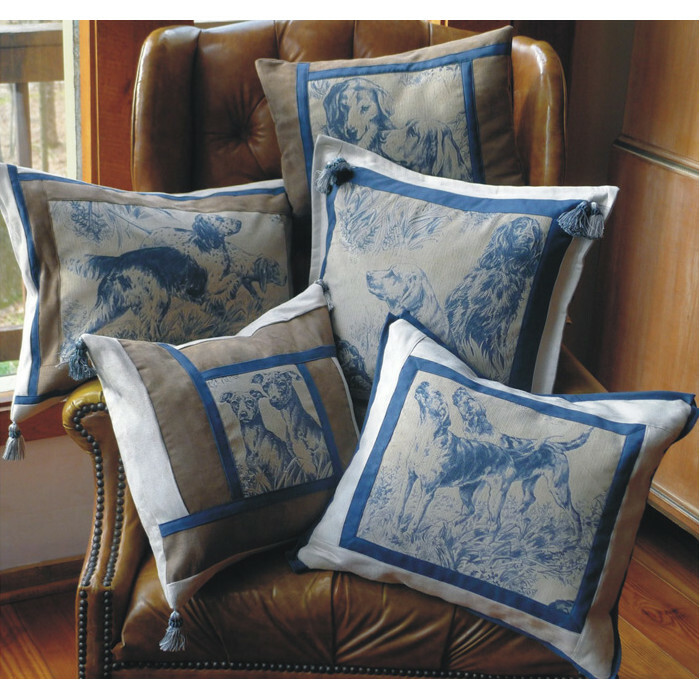 Lee Jofa printed linen portraying 7 dog breeds. Select the breed you want. Tassel trim around outside edge. Choose from Norfolk/Norwich Terrier, Welsh Corgi, West Highland Terrier, Yorkie, King Charles Spaniel, Jack Russell, Pug. Red or Beige background. English Breed bordered in damask stripe. 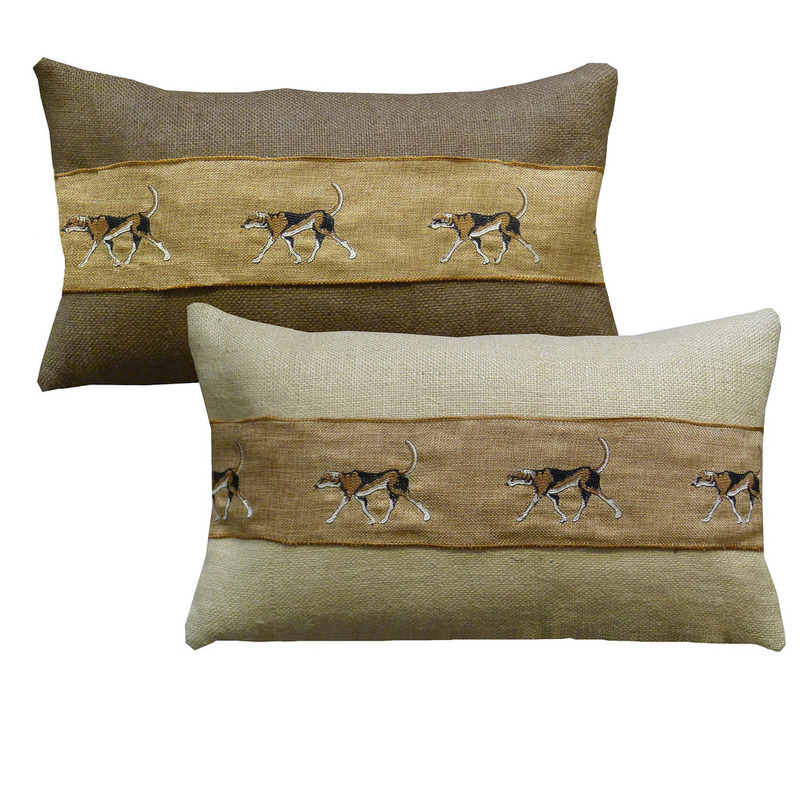 Lee Jofa printed linen portraying 3 dog breeds. Select the breed you want. 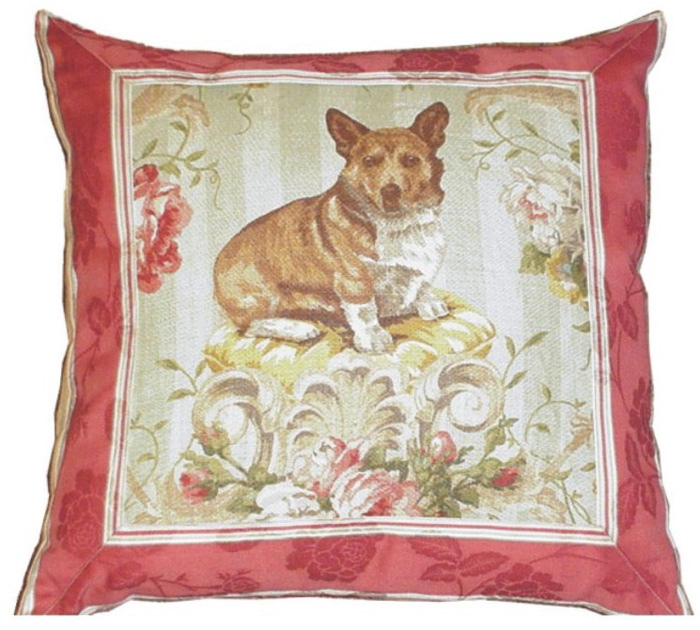 Choose from Norfolk/Norwich Terrier, Welsh Corgi, Yorkie,. 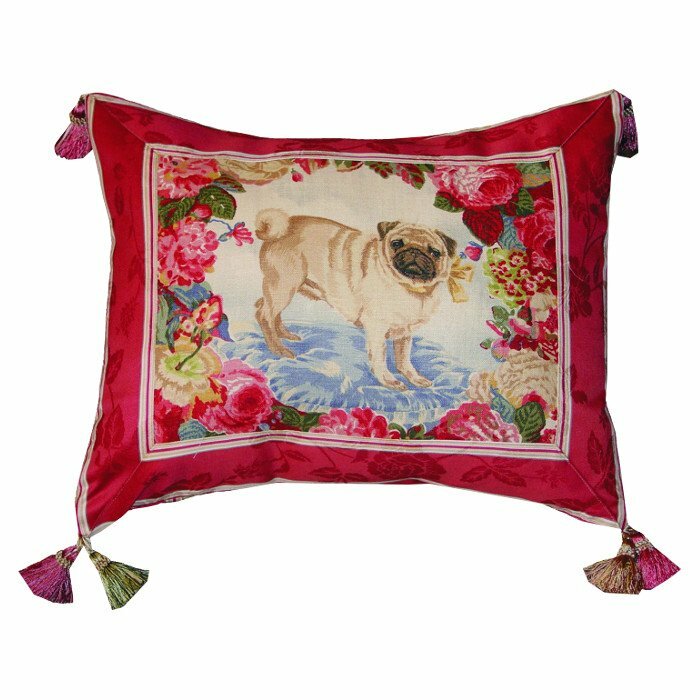 Pug with damask stripe border. 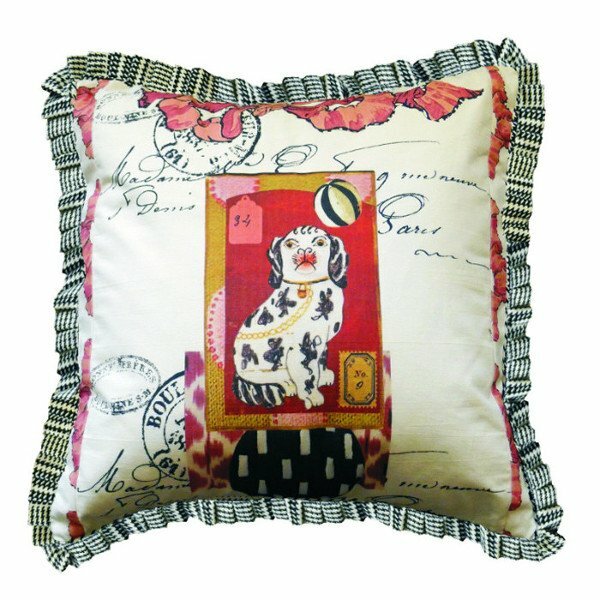 Lee Jofa printed linen portraying Pugs. 18×18 Black and yellow lab puppies on minky, original art work by Eclectic House, solid back. 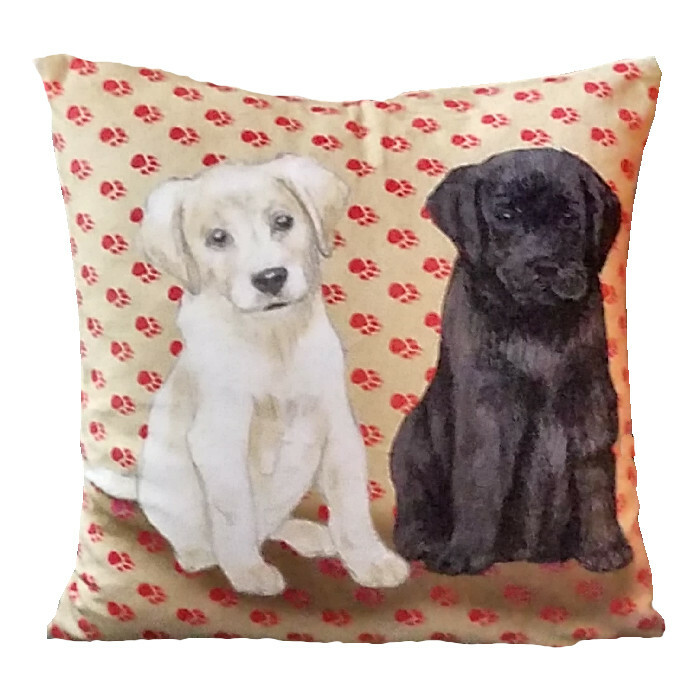 18×18 black and yellow Lab puppies on minky, original art work by Eclectic House. 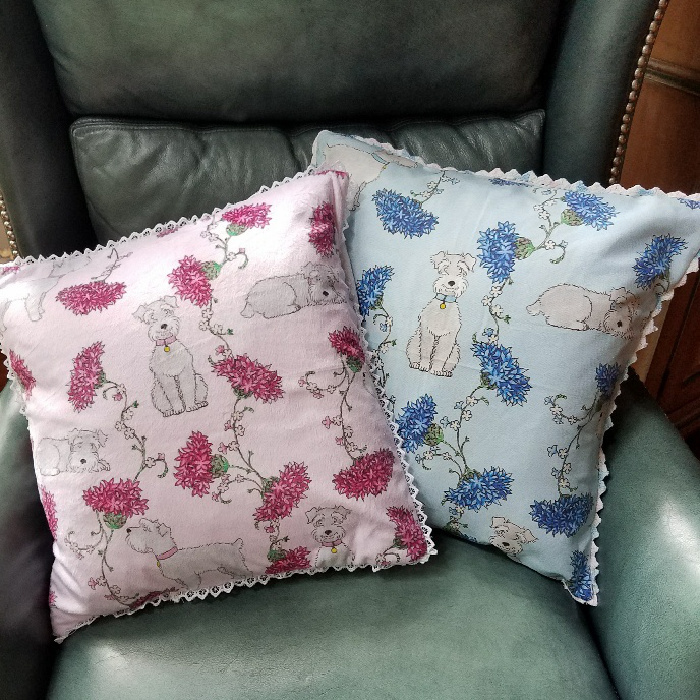 16×16 pillows of minky printed with Snauhzers, available in pink or blue background. 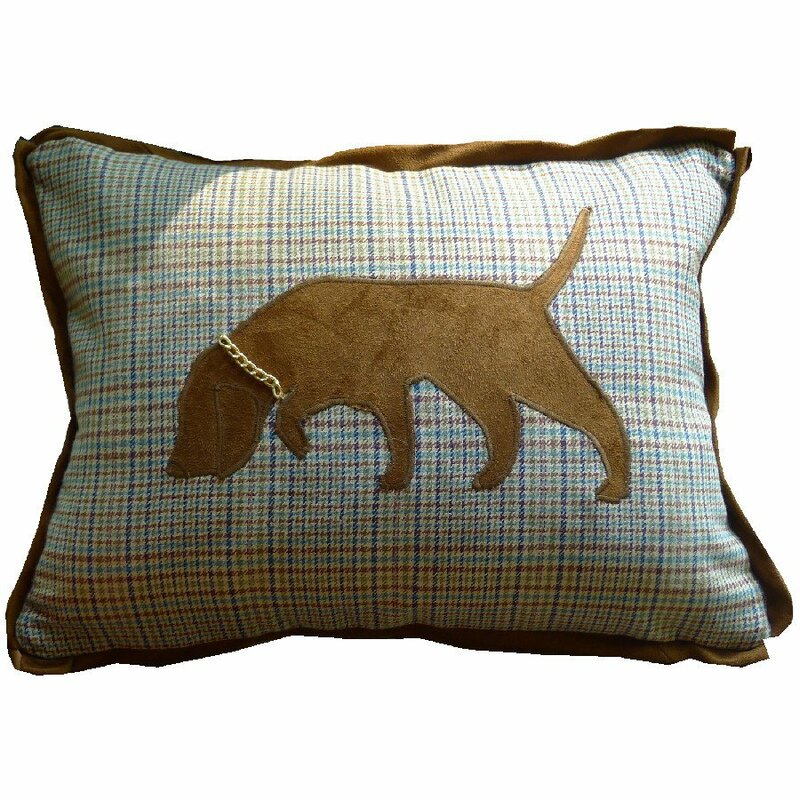 Embroidered hunt dog horizontal obi on burlap. 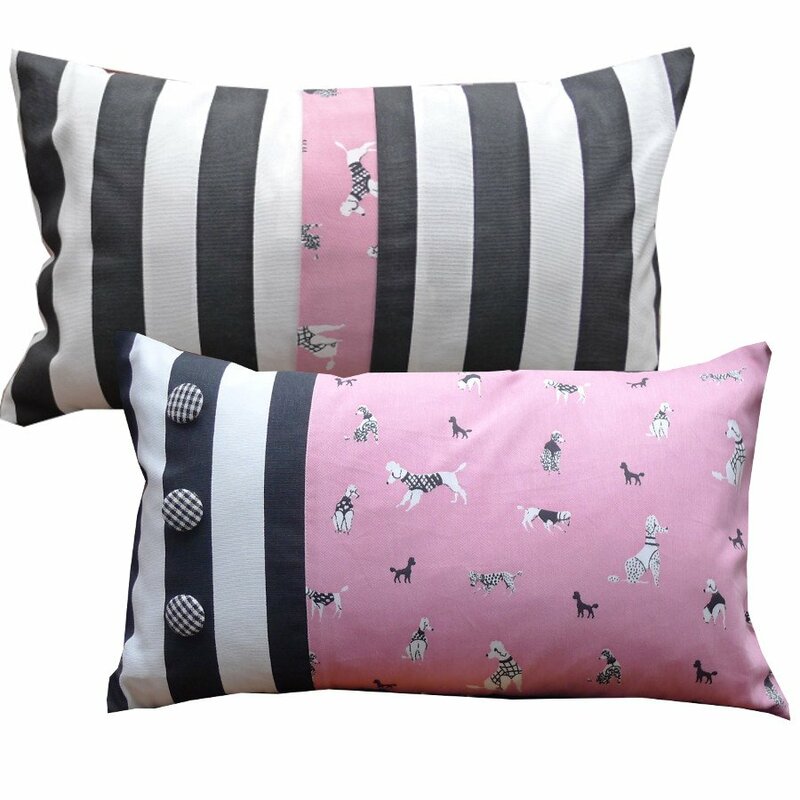 12×20 Pink Poodle pillow with black & white stripe trim. 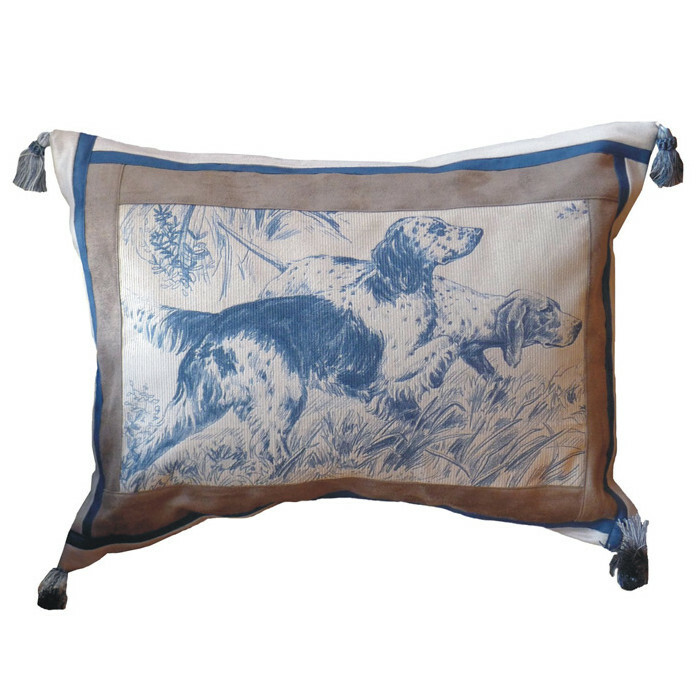 Hunt dog toile with suede borders and back. 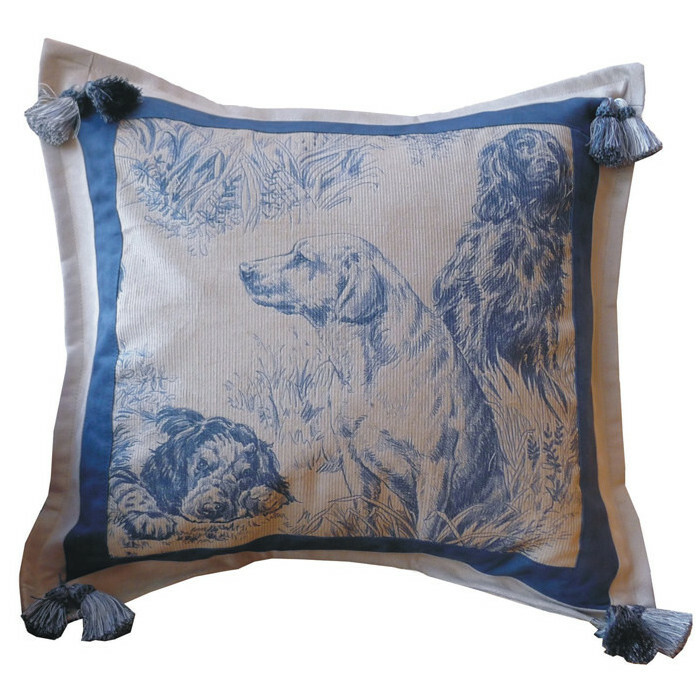 18×18 Hunt dog toile with suede borders and back, corner tassels. Lab, Spaniels. 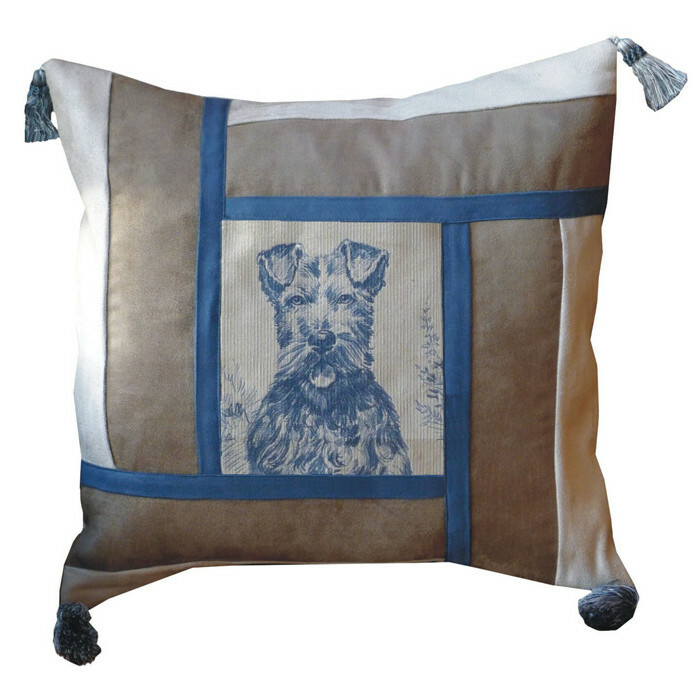 16×20 Hunt dog toile with suede borders and back, corner tassels. English Pointer and Brittany Spaniel. 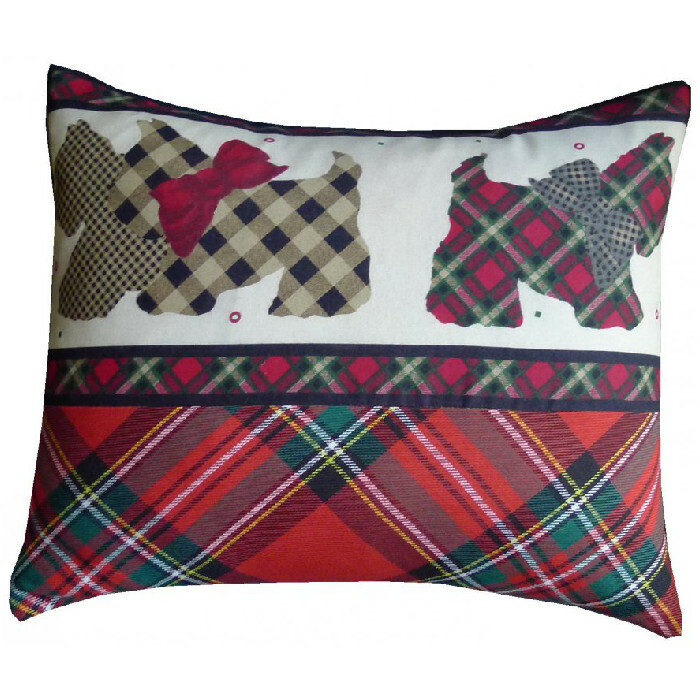 14×18 Christmas Scottie, Tartan and border print. 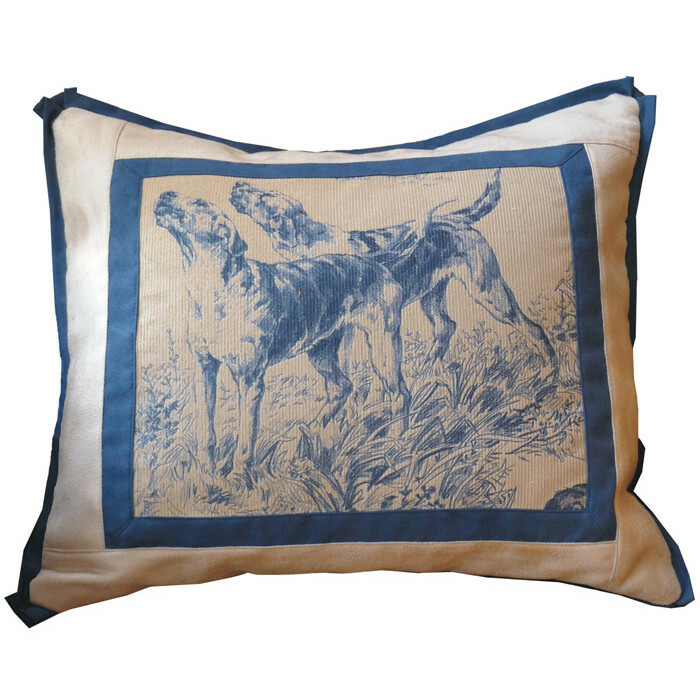 Sporting Dog Group Hunt dog toile with suede borders and back.